The powder was so light you hit bottom and ran over a rock. The core-shot was bad but not as bad as your friend that dropped the cliff, broke his ski in two, and had to ski out on one ski. Now what? Some repairs are easy to do at home or by a ski shop, others may be worth sending to the manufacturer. P-tex fills in minor scratches in the base, and files and diamond stones grind edges back to ice cutting perfection. At your local ski shop, buy Polyethylene candles (P-tex), metal and plastic scrapers, base cleaner and general or temperature specific wax. If you trust yourself to sharpen your edges, buy a kit with a variable bevel edge sharpener. You’ll also need a razor blade and a blowtorch, candle or a Zippo lighter (something that can stay burning for more than 30 sec.) and a clothes iron, preferably without steam holes. If you really want to get into tuning your boards, buy or build a worktable with ski or snowboard clamps. Otherwise, two chairs will be fine. Be sure the work area is well ventilated. Tie your breaks back with a rubber band or string. Carefully cut any chunks from the affected area without making the gash bigger or deeper. Wipe down the entire base with the citrus cleaner. Hold the P-tex in the fire until it burns on its own, spinning slowly until it becomes liquidy. Drop the P-tex into all the holes and scratches of both skis as accurately as possible. Don’t worry if it gets on the edges. Let it cool. Set the ski against a wall if you don’t have clamps, and scrape the base with the metal scraper until the repaired spots are flush. With your board or ski set in clamps, gently run the diamond stone over any burred spots on both the bottom and side of the edge. Set your preferred bevel and run the sharpener over the edge in one direction only, from tip to tail. Flip the ski or board to its side and repeat the process for each edge. Test the edge at various places by scraping your fingernail on it, if nail flakes off, your boards are sharp. Wipe down the bases with a dry rag. Touch the wax to a hot iron over the ski or snowboard, dripping a trail from one end to the other. A little goes a long way, so the drips should be about an inch or so apart. Iron the base, spreading the wax from edge to edge, tip to tail. Direction does not matter as much here. Let it cool. Scrape with the plastic scraper over newspaper. You’re ready to hit the slopes again. Ski shops have expert technicians with machines for the perfect bevel to sharpen your edges, grind your bases, and wax, overnight. For the occasional blown out edge, delam. or core shot, experienced technicians will repair your boards by hand. This will take a couple days, so it’s a good time to demo new equipment for the future. Once repaired the ski or snowboard will ride fine, but ski may break under extreme pressure due to the compromised integrity. Technically, ski manufacturers only warranty manufacturer defects. When the pressure of a landing flattens the ski tip and separates the top and base sheets, the ski has delaminated. Manufacturers know skiers constantly push the edge, and a ski that lasts will get good verbal promotion, so they often cover delamination in the warranty. The exception is racer’s skis because gates hit the skis at speed up to 150mph, enough to break an arm. For your friend who hucked the cliff and broke the ski in half, there may be hope. 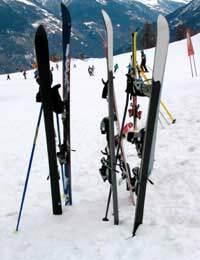 Contact the ski’s manufacturer, or ask your repair shop to send the skis back. At the company’s discretion, they will send you a new pair. It is a small industry, word of mouth is the best marketing tool, so many ski and snowboard manufacturers, including clothing and accessories, will replace your gear if they do not find damage beyond proper use. However, if you repeatedly return skis broken, you may be denied, and should probably look for a stronger ski anyway. Tuning and repairing your own boards can be satisfying, but sometimes it’s nice to let repair shop technicians do the work, baring that, beg for mercy from your manufacturer and hope for a new pair of skis or snowboard. If all else fails, it was time to upgrade anyway.